From the sister company of Seabreacher (check out my article on the Seabreacher here), comes a water sports accessory that will send you flying high above the water. The Jetovator attaches to a personal watercraft (PWC) and utilizes water thrust to propel above the water and maneuver in all directions. Check out the video below to see the Jetovator in action. 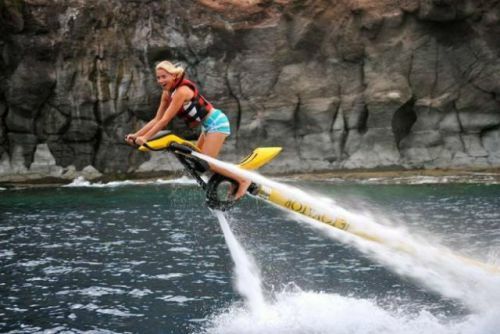 The Jetovator is a version of the Flyboard (for Flyboarding information, check out this article). The main difference is that the Jetovator has a seat and handles, where the Flyboard is just a board. This makes the Jetovator slightly easier to learn than the Flyboard (but only slightly, because the Flyboard is pretty easy to pick up). To fly high with the Jetovator, you first have to have a PWC. As I mentioned, the Jetovator is an accessory, and can't function without the power provided by the PWC. The PWC provides the water thrust, from its jet unit, that elevates the Jetovator above the water. There is a 40-foot hose that tethers the Jetovator to the PWC, and the PWC just follows behind when the Jetovator is in flight. This design means that it takes two people to run the Jetovator--one person manning the PWC and one operating the Jetovator. Controlling the height and direction are pretty much the only things you have to learn with the Jetovator. There is water thrust that shoots from the bottom of the Jetovator, and that propels you into the air. The PWC user will usually take the throttle up to about 80% to get the Jetovator rider above the water. The thrust that comes out of the Jetovator's handles allows you to maneuver the unit. The Jetovator can reach forward speeds of up to 25mph with the PWC trailing behind. It can also travel about 25 feet into the air. 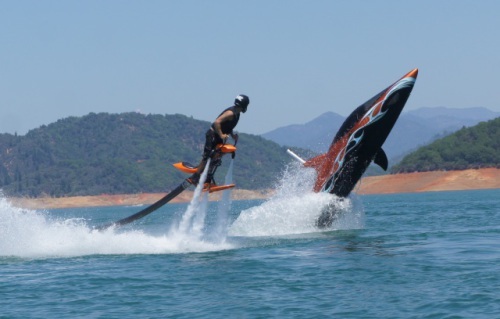 Skilled Jetovator riders can perform stunts, like flips and underwater dives. Though it doesn't take long to learn to ride the Jetovator, learning tricks will take a while to master. You can get a Jetovator kit for around $4,000 at most distributors, but keep in mind that you'll need a PWC capable of 130 horsepower to operate the Jetovator. 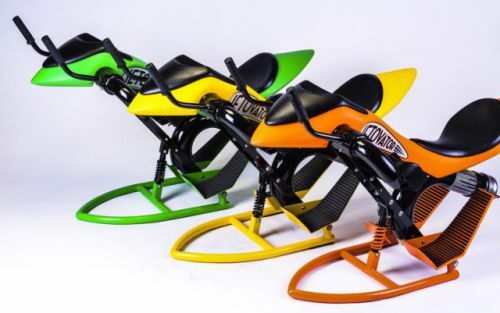 Visit the Jetovator website for more information on this water sports accessory, including info on Jetovator distributors.